BATON ROUGE — What’s for dinner? Wow — as a home cook, how often I’ve heard that question! So when I picked up Curtis Stone’s new cookbook, What’s For Dinner?, I couldn’t resist the question. Amen! I’m there. I know exactly how he feels, but the problem for me is that my mother never wrote anything down. So today all I have is the longing for her cooking, the smells and tastes and the fleeting glimpses of her stirring the pot that I remember. So when Chef Stone said his great food memories drift back to his childhood, I was curious to read on. It helped that the photography in the cookbook was spectacular. But the “proof is always in the pudding” and it was the wonderful, yet simple recipes that I enjoyed. Just reading the recipes, I could already tell they tasted good! These are some of my favorites. Bring a large pot of salted water to a boil over high heat. Add the fettuccine and cook, stirring often to keep the strands from sticking together, for about 8 minutes, or until tender but still firm to the bite. Meanwhile, heat a large heavy skillet over medium-high heat. Add 2 tablespoons of the oil, then add he shrimp and cook, stirring often, for about 2 minutes, or until opaque around the edges. Season with salt and pepper. Add the shallots, garlic, and jalapenos and cook, stirring occasionally, for about 2 minutes, or until reduced slightly. Drain the pasta well, add it to the shrimp mixture, and toss gently to coat with the sauce. Add the tomatoes, parsley, lemon juice, butter, and the remaining 2 tablespoons olive oil and toss gain to melt the butter and coat the pasta. Season to taste with salt and pepper and toss well. Divide the pasta and shrimp among four pasta bowls and serve. Heat a large heavy skillet over medium-high heat. Add 2 teaspoons of the olive oil, then add the beef and cook, stirring occasionally and breaking up the meat with a wooden spoon, for about 4 minutes, or until it loses its raw look, Using a slotted spoon, transfer the beef to a bowl. Return the pan to medium-high heat and add the remaining 1 teaspoon olive oil. Add the onions and cayenne and cook, stirring occasionally, for about 1 minute, or until the onions begin to soften. Stir in the garlic, followed by the celery and cabbage, and cook, stirring often, for about 3 minutes, or until the vegetables are slightly tender. Stir in the hoisin sauce. Return the meat to the pan and cook for about 30 seconds to blend the flavors. Stir in 1 cup of the bean sprouts, the carrots, and one-third of the scallions and season to taste with salt and pepper. Remove the pan from the heat. Arrange the lettuce leaves on four plates. Spoon some of the beef mixture into each of the leaves and garnish with the cilantro, remaining bean sprouts, and scallions. Serve immediately, with lime wedges and hoisin sauce on the side. To make the creamed spinach: Heat a large saucepan over medium-high heat. Add the olive oil, then add the onions and cook, stirring often, for about 3 minutes, or until translucent. Add the spinach a handful at a time and saute for 2 to 3 minutes, or just until it wilts. Transfer the spinach to a sieve and press firmly to remove as much liquid as possible. Add the cream to the saucepan, bring to a simmer over high heat, and simmer for about 2 minutes, or until slightly thickened. Stir in the spinach. Coarsely crumble half of the blue cheese over the spinach and toss to coat. Season lightly to taste with salt and pepper. Keep warm over very how heat. To cook the steaks: Place a wire rack on a rimmed baking sheet. Sprinkle the steaks with salt and the cracked pepper, pressing the seasonings into the meat. Heat two large heavy skillets over high heat. Add 2 tablespoons of olive oil to each skillet, then add 2 steaks to each skillet and cook for about 4 minutes per side, or until the meat feels only slightly resilient when touched with a fingertip for medium-rare. Transfer to the wire rack and let rest for 3 minutes. Place the steaks on four dinner plates and spoon the creamed spinach alongside. Sprinkle with the remaining blue cheese and serve. To make the cake: Position a rack in the center of the oven and preheat the oven to 350°F. Spray a 9-inch round cake pan with nonstick olive oil cooking spray. Line the bottom of the pan with parchment paper and spray the paper with nonstick olive oil spray. In a medium bowl, whisk the flour, baking powder, and salt together. In a large bowl, combine the sugar and rosemary. Add the orange and lemon zest, then rub the mixture between your fingertips until it is moist and fragrant. Add the eggs and, using an electric mixer, bat on medium-high speed for about 5 minutes, or until pale and thick. Beat in the milk. Gradually beat in the olive oil. Using a wooden spoon, stir in the flour mixture just until blended. Spread the batter in the pan. Bake for about 35 minutes, or until a wooden toothpick inserted into the center of the cake comes out with moist crumbs attached. Let cool in the pan on a wire cake rack for 15 minutes, then invert the cake onto the rack and remove and discard the paper. Invert the cake, right side up, onto a cake plate. Meanwhile, make the compote: In a large heavy skillet, bring the rhubarb, strawberries, sugar, and lemon juice to a simmer over medium-high heat, stirring often. Continue to cook, stirring often, for about 5 minutes, or until the juices thicken slightly and the rhubarb is falling apart. Let cool. Sift confectioners’ sugar over the cake. Cut the cake into wedges, place on dessert plates, and spoon the compote on top. Drizzle a little olive oil around the cake and serve. Chef Stone’s cookbook was so beautifully done that I wanted to “eat the pictures!” which is a real credit to the photographer Quentin Bacon. As a reader and home cook, pictures are so, so important. If I can see what the food is supposed to look like, maybe I’ve got a shot at making it. Chef Stone’s book comes out Tuesday, April 9 and I believe it’s worthy of adding to your cookbook collection. 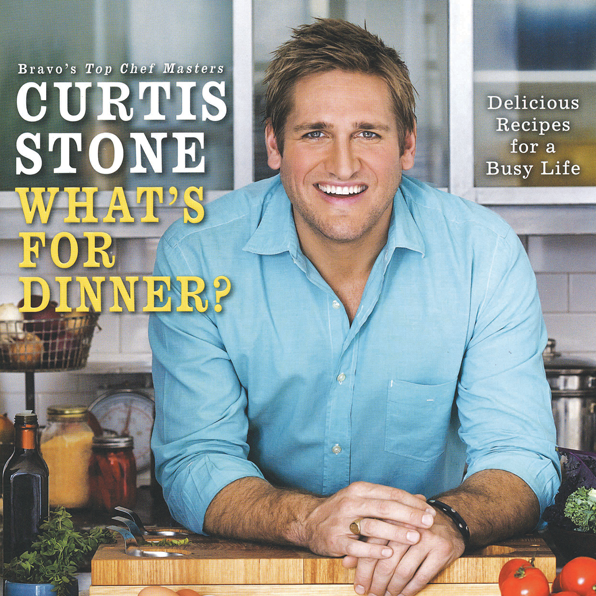 Curtis Stone will be at the Tanger Outlet Mall in Gonzales on Saturday, April 6.